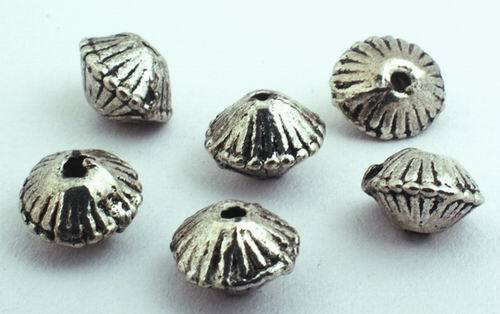 Price is per 50 of these large silver colour bicone bead spacers. Each measures 8mm x 6mm - heavy! Although findings are essential for creating any kind of jewelry, it's easy to forget about them when you are shopping for beads. Findings are like background music in movies. Jewelry with no findings will fail to dazzle, just like a movie with no music will fail to thrill the audience. The findings enhance and accent the focal beads without drawing too much attention to themselves, but you really need to have them to create a functional jewelry.